The Empathy Between Species Project is a 3 year Black and White Film Photography Project that focuses on highlighting and increasing awareness about the treatment of animals in East Africa. Every day, across the world, animal abuse and cruelty through ignorance is happening on a larger scale than most of us like to admit. In places like Tanzania alone, there are around 4 million cats and dogs (and other animals) kept as domesticated animals and, historically, the idea that dog is “man’s best friend” is largely absent in places like Tanzania, Rwanda and Kenya. Slowly, this is changing. EBSP believes that change starts with the younger generation and that children are they key to creating a new, positive and caring attitude towards the animals that make up a large part of our lives. Working with children to get the EBSP message out, will, in turn, better the future for every being that occupies the land. EBSP is proud to say that we have partnered with some fantastic Organisations, Charities and Businesses (listed below). Over the next 2.5 years, EBSP will work with various Organisations, Schools, Animal Rescue/Welfare Centres, Conservation Wildlife Projects, Children’s Homes and Companies to bring the Empathy Between Species Project message to as many as possible throughout East Africa. Mahatma Gandhi once said “The greatness of a nation and its moral progress can be judged by the way it treats its animals.” By bettering the treatment of the animals we share the planet with, we in turn better things for ourselves. 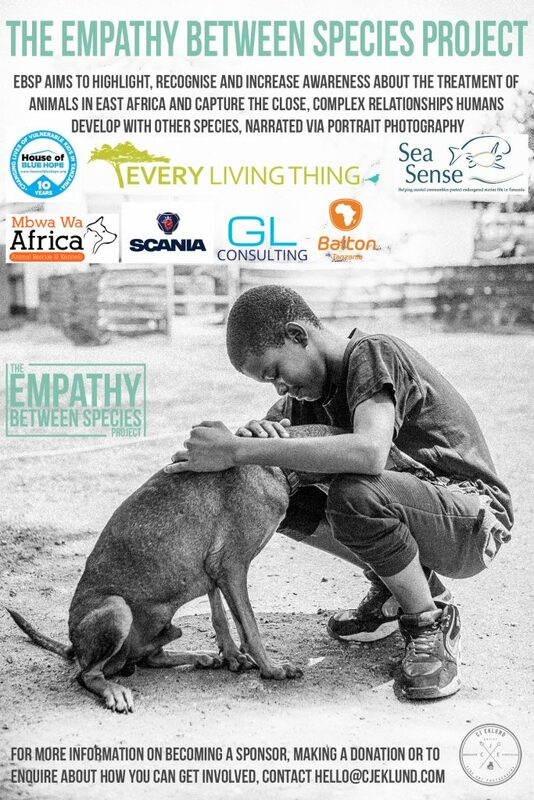 The Empathy Between Species Project is currently partnered with the following Organisations, Businesses and Charities. Sponsorship and Donations are extremely important to a project. If you or your Organisation, Charity or Business would like to sponsor or donate please contact CJ Eklund on the email listed above. Every little bit helps.